Christian art? Art is art; painting is painting; music is music; a story is a story. If it’s bad art, it’s bad religion, no matter how pious the subject. This past weekend we had the honor of hosting the Seattle premiere of the new film Last Days in the Desert, a fictional account of the last few days Jesus spent in the wilderness following his 40 days of fasting and praying and ultimately facing temptation by the devil. With very little dialogue, the movie beautifully portrays the struggle of sons to fulfill their destinies while in desperate need of direction and affirmation from their fathers. It’s a spare, quiet, deeply thoughtful film that does a better job portraying the “fully man” side of Christ than anything else I’ve seen in the 40 years I’ve been a Christian. And yet, it’s probably not what anyone would consider a “Christian” film. There are no bold declarations of faith. The Bible is not quoted. Nobody gets saved. There are no tie-in Bible studies available at the local Christian bookstore, and no Christian singers provide a theme song at the end of the movie. In fact, it appears that the filmmakers are aspiring to do everything they can to avoid the label of “Christian,” even when the subject matter is the very center of the Christian faith. Last Days in the Desert shows an incredibly beautifully light. Filmed using only natural light by Oscar winner Emmanuel Lubezki in the Anza- Borrego Desert State Park in California, the movie is an intimate study of Jesus’ last moments before exiting the desert and moving into the last three years of his life–the most impactful years of his life. Yeshua, as he is called in the film (a brilliant idea by writer-director Rodrigo Garcia) is alone at the beginning of the movie. The only sounds are his footsteps, the wind blowing through the crevices and canyons, and the occasional laugh as he sits, thinking, wondering, and praying. Dirty skin, yellowed teeth, and a weary countenance–this is not the Jesus of modern Bible movies or mini-series. 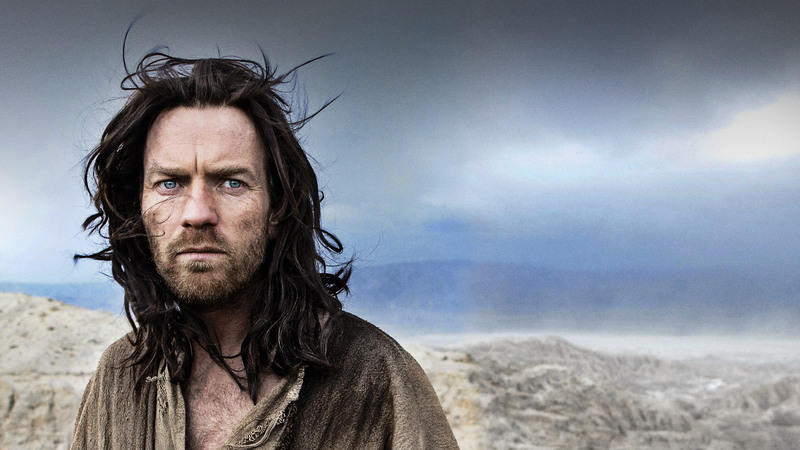 As played with quiet brilliance by Ewan McGregor, this Jesus looks like a guy one would meet in the wilderness after 40 days of wandering. While McGregor may be a bit too old to play the part, I’ve only seen one better version of Jesus in a film (Ralph Fiennes in the Welsh-Russian animated film The Miracle Maker). It’s a phenomenal performance. Over the course of the film, Yeshua talks with each member of the family and attempts to help them chart a course. He helps the son open up and talk about what he desires, the future he wants that will lead him away from his father. Yeshua and the father talk about what it means to parent a son, to want something for him, and know that you don’t really understand each other. These moments are spread apart with brilliant quiet breaks interspersed where nobody speaks, there is very little movement, and the viewer is left to sit and think, even as the film continues. In perhaps the most bold experiment in the film, Yeshua has many conversations with the devil, which is appropriate considering the subject matter. Even better, he is played by McGregor as well, dressed nearly the same as Yeshua–but cleaner, decked out in jewelry, and with more of the boyish grin that the actor is so well-known for. Their conversations are brilliant in part because they show the devil at his best–or worst, as the case may be–and it’s not the cartoonish epitome of evil most Christians are familiar with. The devil is well-spoken, engaging, and charismatic. His goal throughout the film doesn’t seem to be to truly dissuade Yeshua from the destiny his father has planned for him, but to get him to think more deeply about it. The devil’s best temptations never come as a result of us choosing directly to go the wrong way, but come about because we get so busy thinking about the what if’s we face–and the more we think, the more we can reason away what is right or good with what is convenient, expedient, or easier. It was the what if that led Eve to listen to the serpent’s words, after all, and it’s the what if that makes the devil’s temptations so effective. These conversations with the devil imply that Yeshua’s full humanity is still foremost at this point in the story–which may be what more conservative Christian viewers find troubling. The devil has a better sense of eternity and even seems to be more empowered than Yeshua, who appears to still be discovering what his next steps are. I love this idea, personally, because the 40 days in the desert take place after God speaks “This is my beloved Son” after the baptism by John. The father gives this grand announcement about his son, and then leaves him alone, without food or water, in the desert to be confronted by his greatest fears and worries. In this state of weakened confusion, Yeshua’s conversations with the devil are understandable, and the devil is not above teasing the son about the father. The devil, in fact, is one of the most engaging characters in the film–but then, so is the devil in real life. A scary and frightening boogeyman is less likely to wreak havoc in one’s thoughts and emotions than a charming and clever person with wit, wisdom, and just a hint of sarcasm. Ultimately, though, Last Days in the Desert is not about the devil. Garcia wisely chooses to limit his screen time and focus more on the relationship between Yeshua and the sad family he encounters. Their interactions are quiet, sometimes odd, and frequently melancholy. There is a great sadness to the film as well, as we can feel the inner struggle of four people who desperately want to understand their destinies and place in the world–yet have no way to truly express the depths of their feelings or actions. Even when the story takes a sudden turn, leaving death and sorrow, the movie doesn’t give easy answers. Yeshua doesn’t save someone who he probably could have. He begins to heal the sick, but is stopped before his prayer can be answered. And ultimately, he leaves the story as he began it: alone–but with a difference. The last spoken line in the movie belongs to the devil, who says to Yeshua, “I’ll be there at the end. Just give me a signal, and I’ll get you down.” Yeshua looks at him and turns away with a resolve not evident earlier, clearly ready to embrace his place in the world and fulfill his father’s destiny. There is beauty in silence, in being quiet, and in a world where “Christian” art proclaims as loudly as possible that “God is not dead” (and I agree, He is not, but I don’t need a hashtag to argue the fact), a movie like Last Days in the Desert will struggle to find its place. In a world that values the piety of a film (where the message matters) more than the quality of the filmmaking, the acting, or the depth of the story, it will not be easily embraced. It is not easily labeled, which means it will struggle to find its place. Much like the characters in the film, it wants to know its place in the world, the destiny laid before it.